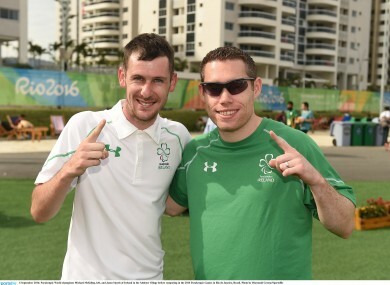 NOT THAT HE needs any extra motivation, but Michael McKillop will be eager to match the feat of Jason Smyth by striking gold in Rio’s Olympic Stadium later today. The two Irish athletes have shared a room with each other at every international competition for as long as they can remember and have a fair share of honours between them; 20, in fact. And after Smyth won his fifth Paralympic gold on the track on Friday, McKillop has the chance to follow suit and overtake his team-mate in the major medal charts. “He is obviously the fastest Paralympian on this planet and he is in the blue riband event, so a lot of interest is taken in him, but if you look at world titles and Paralympic titles I can go one ahead,” he said, with a wry smile. The 26-year-old is in action at 3.59pm Irish time today as he goes in the T37 1500m medal chance, looking to defend the title he sensationally won in London. Indeed the three-time Paralympic gold medalist has experienced his fair share of success but with it comes expectation. “I’m very much excited, obviously I will have to live up to people’s expectations once again, I’m going on ten years at the top of my sport and every time since the day I won my first world title at age 16 people expect me to win,” he continued. “That’s my ambition my aim and my goal to go out there and retain my title. I think when you have to live up to expectations and when you compete in Paralympic sport people see you as a disabled person rather than an elite athlete and I want to prove people wrong whenever it comes up to people’s expectations I want to prove people wrong and I want to continue my winning streak. The friendly rivalry between the pair engenders a winning environment, in which both athletes are fully focused and feed off each other. “It’s quiet interesting, he’s got a wife and I have a fiancée and he’s got a child,” McKillop says of the relationship. “We’re probably not as mad as we used to be or up to mischief, but we’ve got the combination right and we know each other’s like and the atmosphere we would like to have before competing in the apartment and leading into these Games it’s no different. Just like Smyth, McKillop hasn’t enjoyed a particularly good time of it on or off the track in the four years since London. He has battled with injury and the frustrations spilled into his everyday life. For all the memorable days, there have been some dark ones along the way for the Antrim athlete too. “The previous two years were mentally a tough time,” he admits. “With the support of my fiancee and the rest of my family, they got me through. “2014/15 season was pretty much a no-goer. My mental health wasn’t good. I wasn’t in a good place personally. I got away with it at the European and World Championship through talent rather than hard work, I was lucky. As defending champion, McKillop is the hot favourite to replicate his success of 2012 in Sunday’s T37 medal race. Injuries have meant his build-up has been slightly impacted but he’s in a confident frame of mind that he will bring home a gold medal to his room-mate later tonight. “Obviously the years have caught up on me slightly,” he added. “I’ve had foot injuries. There’s underlying problems and have been for years. There’s no real excuses, you either step off the track and don’t even compete and that’s not in my vocabulary, that’s not in my personality, I want to go in and compete and do the best I can. “There’s no excuses, any athlete competing at these Games, it’s not because you have a disability why you’re here, you’re here as an elite athlete. You’re here to perform at the highest level, whenever I step onto the track at able body sport which enables me to compete at my maximum limit and I finish fifth, I don’t think I’m the first Paralympic athlete, I think I’ve been beaten by four other guys. Email “The golden boys: McKillop using Smyth room-mate rivalry to spur him on for Rio defence ”. Feedback on “The golden boys: McKillop using Smyth room-mate rivalry to spur him on for Rio defence ”.